The Galapagos tortoise species Chelonoidis elephantopus was presumed extinct for 150 years, a victim of whalers, pirates, and human settlers. But this month, scientists announced evidence that a lost population of these giant tortoises exist on nearby Isabela Island. That evidence came in the form of "genetic footprints" of the species in the DNA of their hybrid offspring. The research was published in the January 10 issue of Current Biology. A team of scientists, led by Adalgisa Caccone, had earlier discovered traces of DNA matching that of C. elephantopus within 11 tortoises of another species, C. becki, native to Isabela Island. The researchers suspected that individuals from Floreana ended up on Isabela thanks to traders and pirates, and the genetic evidence suggests that they could live there still, interbreeding with local tortoises to produce a hybrid population. 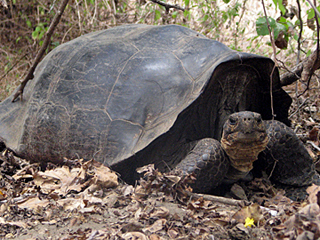 This finding inspired Caccone's team, led by Ryan Garrick and Edgar Benavides, to take a closer look at the genetic makeup of Isabela Island's tortoises. The team returned to Isabela Island to collect more DNA samples. They collected samples from 1,669 tortoises, nearly 20 percent of the estimated population of the island. They found that 84 of the newly sampled tortoises are first-generation hybrids, meaning that one of their parents had to be a purebred C. elephantopus. Other Volcano Wolf tortoises had smaller percentages of C. elephantopus DNA in their genomes, indicating that they are at least fourth-generation descendents. It is likely that "extinct" tortoises have been living on Isabela Island and mating with its native tortoises for the last 200 years. The scientists believe that at least some of these parents are still alive: Giant tortoises can live for more than 100 years in the wild, and 30 of the hybrids were less than 15 years old. This is the first time scientists have rediscovered an apparently extinct species by tracking its genetic footprints in the genomes of living descendents. Two options exist for saving C. elephantopus. Purebreds apparently exist somewhere on Isabela Island. However, they probably exist in such small numbers that scientists would need a lot of searching and luck to find even one. The other, perhaps more feasible, option, is to use their direct descendents to start a breeding program. Intensive targeted breeding of hybrids could resuscitate the species. The rediscovery of this species could be a boon to Project Floreana, a huge conservation initiative designed to set a new, sustainable course for the island's future. The return of C. elephantopus to its native island would be an enormous conservation victory for Project Floreana and the entire Galapagos archipelago. Read Yale University's announcement of their scientist's exciting find.